I finished the handbag today. It's a a little wonky, but I think it turned out pretty well for a first attempt. 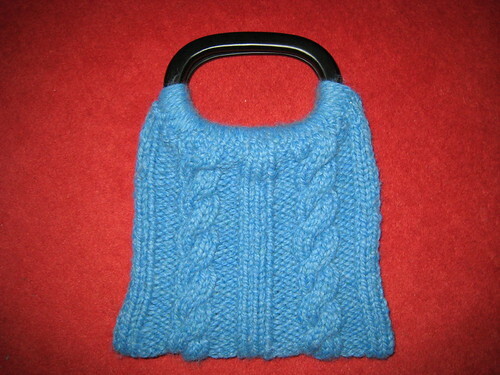 I've made a few handbags before, but this is the first cable knit one. I think the hardest part is getting it attached to the handles. On this one, I used a crochet method which is a little bulky but super secure. Now on to a new project! I think I am going to make this Belt du Jour (PDF link). I'm trying to stick with simple projects since we're going to be moving soon! (The moving part is news item #2 which I keep putting off writing about here. It's no secret, I just never seem to get it out. Soon, I promise.) Have a happy Sunday!